Granola is one of my breakfast staples, especially when I’m craving something crisp and sweet. 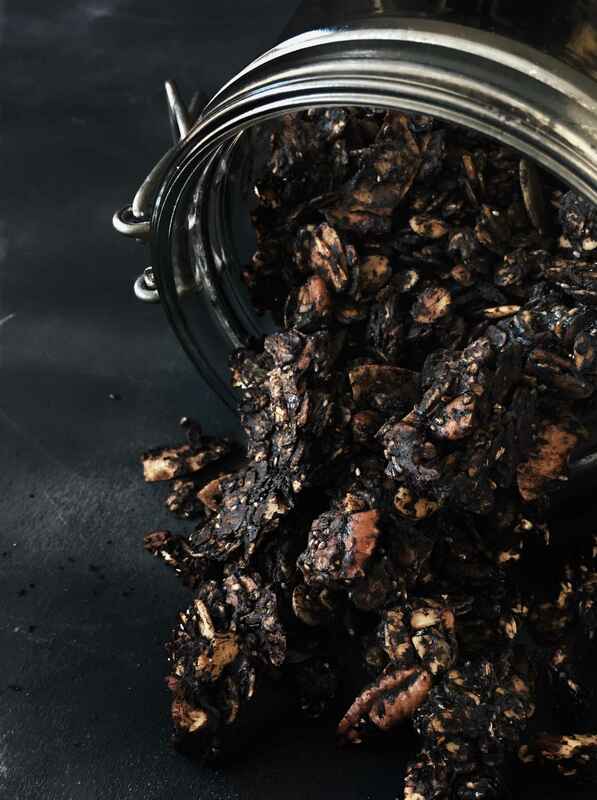 Now since we’re sticking with the Halloween theme we’ll be making black granola flavoured with cacao and vanilla. All we need to turn this from brown to black isblack tahini! You can of course use store-bought black tahini (if you can find it) or make it from scratch, which for me turns out to be cost-effective, all it asks for is a lot of patience and a food processor, you can find the recipe over here. I buy mine in bulk at my asian grocery store and I’m sure they sell them at most asian grocery stores around the world. Now back to the granola! 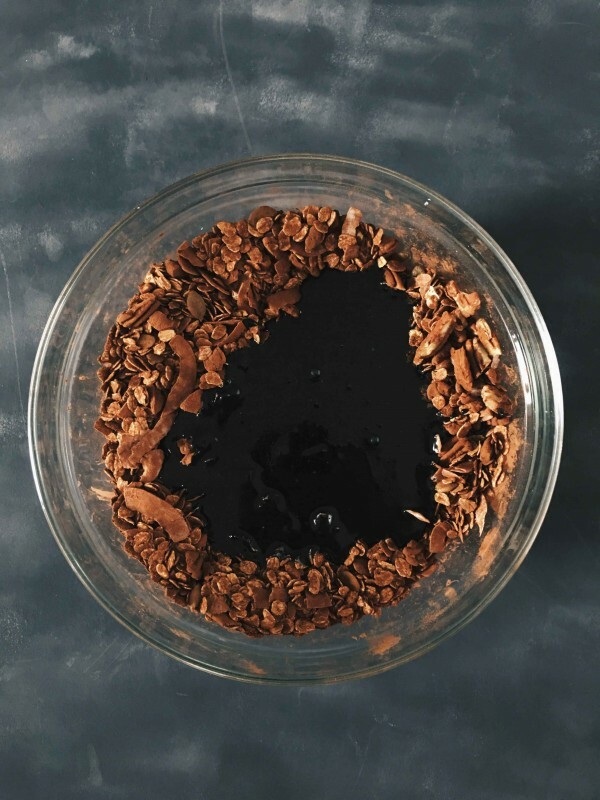 If you don’t yet know what to have for breakfast on Halloween don’t look any further, this granola has to make the menu, I mean it’s literally black and tastes like chocolate, sign me up! I even threw some super foods in the mix by adding some chia and pumpkin seeds, does this make it a health food? Don’t know, but lets pretend it does! 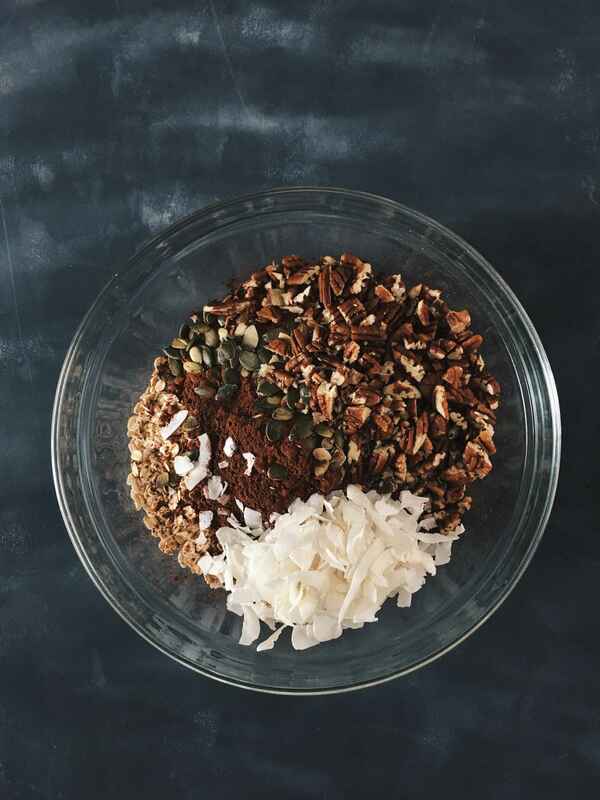 One of the great things about granola is that you can customize it to your own taste. If you do not like pumpkin seeds or hate having chia seeds stuck between your teeth you can obviously skip those and maybe add some sun flower seeds or dried fruits tip: if you add any dried fruits add them after the granola is removed from the oven. 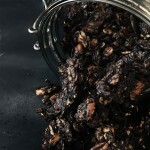 And don’t worry if you really can’t get your hands on any black tahini this granola will still be worth it! Making this granola is super easy, it might take a bit of time baking in the oven, I turned down the heat after 30 minutes which is optional and does increase the baking time. note: I used a very low temperature which increased the baking time, which insured no burnt granola. Just do something else in the mean time, I painted some back drops! You can eat this as a snack, throw it in a bowl with some plant-based milk or add it on top of a smoothie, it’s up to you what you do with it. Now lets start cooking! And as usual feel free to leave a comment below or to tag me into your recreations on Instagram, I’d love to see you’re spooky creations. Bon Appetite! preheat your oven to 125C or 250F. Add all the dry ingredients to a bowl and mix them well. Now to another bowl add all the wet ingredients and whisk them well. Now add the wet to the dry ingredients and mix with a spatula (or your hands) until everything's well combined. Now lay your granola on a baking dish and place it in the oven. Try to give it a little mix with a spatula every 15 minutes and if you're scared it's going to burn you can always turn the heat down to 100C or 200F. I turned the heat down after about 30 minutes, just to be sure and you can take out a little piece every 15 minutes to check if its crisp once it has cooled. I removed my granola from the oven after about 80 minutes. The time depends on the size of your oven and the temperature you used. Let it cool before storing in an air tight container. Enjoy.